Thanks for stopping by our website. We are dedicated to the REO business with offices in Jacksonville, Fort Lauderdale and Miami. 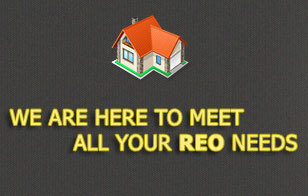 Everyone at FL REO is totally committed in providing above quality service every time. Managing and selling REO properties takes knowledge and experience, the REO specialist needs to understand the intricacies of the local market as well as all the special requirements of a REO to properly handle these assets. Our objective is to meet and exceed your expectations. Each of our services is backed by a team of local real estate professionals. We have proven our ability to do that with dozens of clients. This goal takes commitment and dedication from every member of our team.